Toyohara Kunichika (1835-1900) Thirty-six Good and Evil Beauties: That Person Otyo, 1876. Oban. 36 Good and Evil Beauties is one of the finest series of prints produced by Kunichika. The thirty six designs for this series are especially rich and the early editions are beautifully printed. That Person Otoyo is a particularly interesting print. The subject (Otoya) refers to a beautiful geisha possessed by a vampire cat. In the print, the shadow she casts on the screen is that of a cat’s head and ears rotated through ninety degrees. The Vampire Cat of Nabeshima is the story of Prince Nabeshima and his beautiful mistress Otoyo. One night a vampire cat kills Otoyo and assumes her form. In the guise of Otoyo, the cat nightly drains the life of the prince until a guard accidentally notices Otoyo in the form of the cat; however, she escapes to the country and continues to attack people. Prince Nabeshima organises a hunt and the vampire is eventually killed. 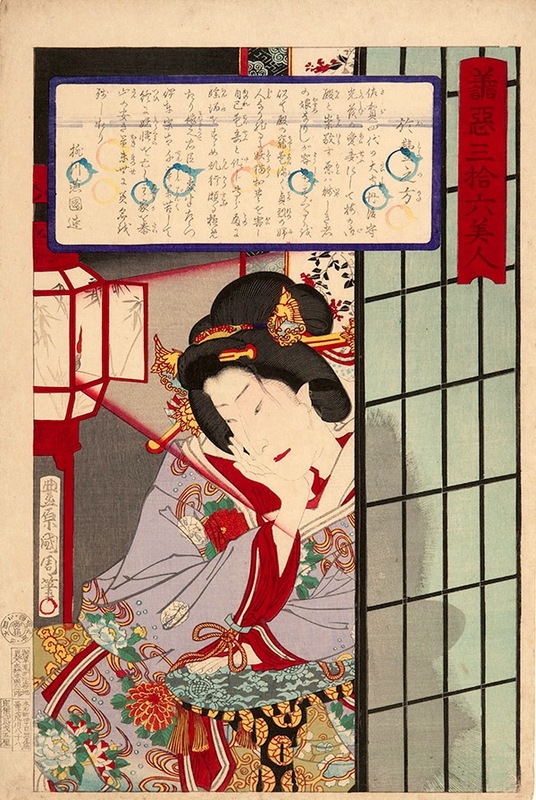 In this exquisite woodcut, Kunichika represents Otoyo as a seductive geisha and her evil shadow cast across the paper screen by the lantern on the left. The print is in perfect condition, full size with strong colours and very good impression. The print is illustrated on page 58 of Amy Reigle Newland, Time Past and Time Present, Images of a Forgotten Master, Hotei Publishing 1999.